Focus is the theme of 2017, and that is how things will be: a little more regimented, a little more symmetrical, making things more reliably updated in terms of content. That should hopefully appease those who may have been thinking rather this blog was perhaps a vanishing venture versus a slow, but steadily expanding space. So we will be returning to our regularly scheduled reviews…I have been reading more than I can review….And I thought it fitting to have one of the supposedly forgotten reads from a Book Expo America pile be one of the spotlight reviews to mark the end of 2016, the year of scattered, disparate reviews….sporadic in nature….and 2017 will be the year of focused intent…with a bigger focus on eclectic reads and celebration of the diversity of the different types of stories out there…fit for any type of reader…even those who have not discovered the joys of reading just yet. Thanks for bearing with my unpredictable, scattered nature! Happy New Years to you all! Of course, this was sure to be a great read, considering the Zuko & Katara ship shout-out that will now forever be imprinted on my signed ARC for time immemorial…It was easy then to rhapsodize about just what type of Zuko & Katara ship goodness the story may provide, filling in the gaps left by the third season of the television series that disowned any hopes that we shippers had at these two characters with such rich dynamics and chemistry (far more than Ang and Katara) had….Would this book provide that? Well the book, as books in my collection are wont to do, tend to vanish into the obliterating blackhole of my book collection…..until they’ve been remembered. For the last few months, before and after work on my long train commutes, I’ve read far more books than I manage to carve time out to review. And lately, my trend of reading has been more Young-Adult oriented, particularly Young-Adult fantasy. Over the last few months, I have read Red Queen and Glass Sword, An Ember in the Ashes and A Torch Against the Night, Throne of Glass, and of course TruthWitch…as I was reminded a few weeks ago that the release of its sequel Windwitch is only a few weeks away from now. 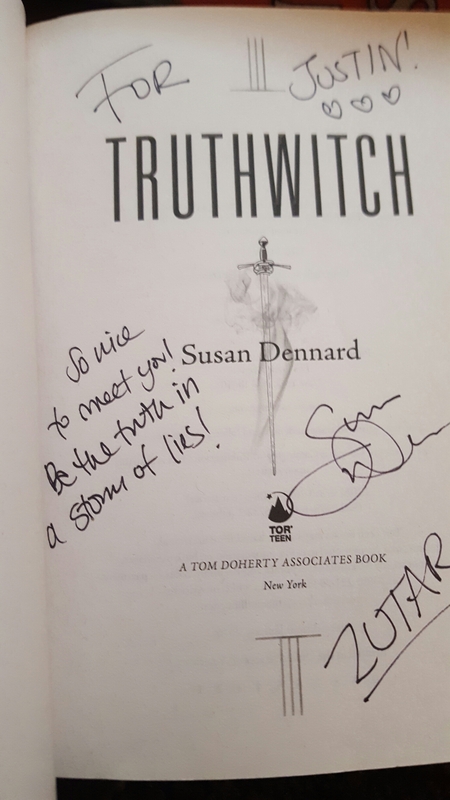 In terms of writing, Susan Dennard excels in balancing very fluid action sequences, while populating her world with vivid, interesting world-building details without these details becoming too onerous or a chore to read…very common with adult fantasy novels that are of the more mediocre variety. And the characters are fantastic. Earlier, I mentioned Katara and Zuko….which may be the inspiration…very light, subtle, respectful inspiration…for both the angsty Merik, a windwitch to boot…the Truthwitch, lead character herself for which the novel derives its name, Safiya. Her best friend Iseult, a weave witch, who is part of a tribe disparaged by many of the other factions and nations, provides a very interesting, refreshing, Bechtold-test passing female friendship rarely seen and depicted in books of many kinds, particularly in the fantasy genre. Normally, the fantasy genre tends to segregate women from other women, keeping them amongst a bunch of fellow men, as they are contrived to be tom boyish women who say they feel estranged from other women. This horrid trend seems to be endemic in fantasy fiction, where even great books like Mistborn suffer from this. Surpisingly, Wheel of Time does not have this problem, a book routinely dismissed though hosts a very interesting gender-based dichotomy in its world. Of course, Truthwitch suffers from some issues…the main male character, a windwitch prince by the name of Merik sometimes seems too sketched out as obvious love interest, you know the slightly stoic, impassive, strong, predictably muscular male hero with a fondness for brooding and acerbic comments…with an unflappable temper and love for being judgmental, at least initially with their love interest in focus. Thankfully, as the story unfolds, his character is more fleshed out, and the chemistry between him and Safiya is very believable and weirdly even very engaging for the readers at times. His motivations and brooding become more rooted in obvious political concerns over the plight of his people and desperate need to help allay some of their struggle, showing him to be more moral, diplomatic, especially as compared to his bullish sister, who is eager to use violence in many ways to get what she wants.. Another problem is that the mythology behind the witches and their magic can sometimes be a little confusing that small info-dumps interspersed throughout the novel, hoping to elucidate certain background details can sometimes feel a little jarring from the novel’s fast pace. So hopefully the characterization of Merik continues to deepen, and the world-building becomes even more natural and seamless in Windwitch. These are not huge issues, just minor, nitpicky things on the whole. The story succeeds with very interesting subplots with political intrigue and machinations, lots of expertly executed twists and turns, along with some great action sequences. The only slowness comes from the aforementioned issues…but the author seems conscious of these things, so they really are very minor for the most part. The overall mythology and future direction of the story seems very well sketched out even from the first book. Where the story excels is where the story’s unique world-building elements or the well-developed friendship of the two female leads causes the story to deliver quite a satisfying punch for huge fans of the Young-Adult fantasy genre, including myself, many of whom are hardly Young-Adults, but are instead readers of all ages who want books with less encyclopedic, pedantic exposition..and more fierce, fluid, exciting character and world-building intertwined. So if you are wondering whether this book is good enough to merit me continue on to reading its soon-to-be-released sequel Windwitch, a few weeks out. The answer is an emphatic YES!